Fukrey actress Richa Chadda visited Rajasthan's pink city, Jaipur, to shoot the latest episode of UTV Stars' Star In Your City. She indulged in the delights of the city, went sight-seeing and also interacted with her fans. The first stop was Hawa Mahal, followed by a shopping spree in the local market. She ended up buying quilts with popular elephant prints, Jaipuri jutis, lamps, umbrellas and accessories. Click Next to see what Richa Chadda did in Jaipur. Richa tried her hand at cooking an authentic Rajasthani dish called Gatte ki Biryani. She tried out Jaipur's folk dance and was particularly excited when she saw the traditional matka dance. She tried a few steps, and looed quite graceful. Richa ended her trip with getting henna applied on her feet. 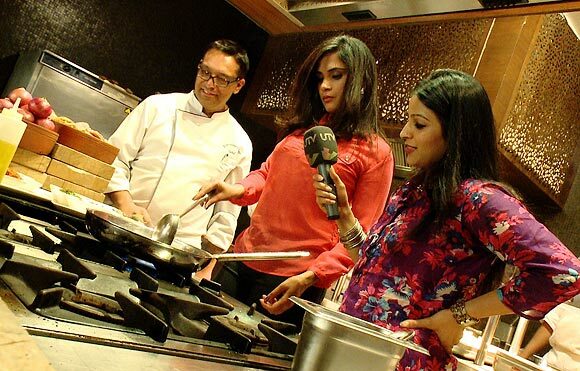 Watch Richa's Jaipur experience on Stars in Your City on June 16, 7 pm, on UTV Stars. PIX: When Adah Sharma was CAGED!